This former 19th century coaching inn located at the heart of the Luxembourg Ardennes has been entirely renovated and redesigned. Hotel Dahm has an exceptional setting where you can experience a warm welcome and great luxury right in the midst of nature. The hotel offers its guests a wide variety of activities to enjoy and invites you to discover a delicious and refined dining experience, modern design and a beautiful terrace and garden. Hotel offers elegant rooms with exquisite amenities. 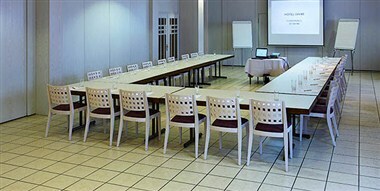 Hotels Conferences, Seminars and Exhibitions area is the perfect location for your professional meetings and office work.